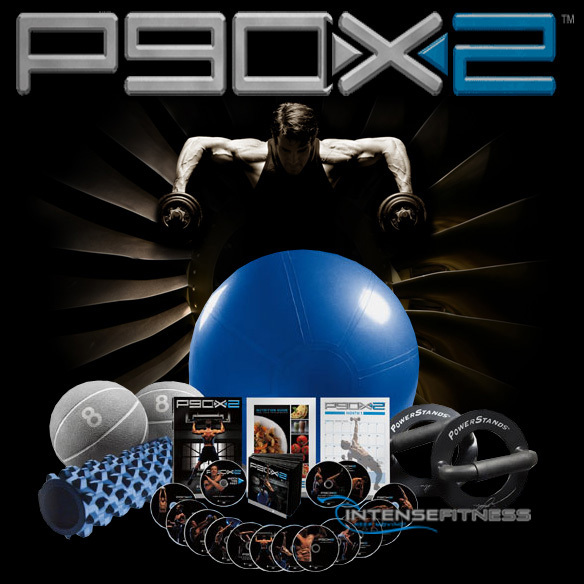 The P90X2 Ultimate home workout kit contains a total of 17 DVDs and more of the key equipment recommended for the P90X2 workout! Order now and get 2 bonus DVDs from Tony’s P90X ONE on ONE workout series – 4 Legs and Upper Body Balance, a $39.90 retail value. Beachbody has provided Intense Fitness with a limited supply of these bonus P90X2 workout DVDs. We are giving them away with each order of the P90X2 Ultimate workout. Are You Ready For P90X2, Ultimate Style? Are you ready to push your body through the craziest home workout ever for the next 90 days? What are you doing for the next 90 days? Ready to workout with Tony to burn fat while building muscle using the science of Muscle Confusion X2? Works on your core muscles using instability, balance, and strength. Explosive movements are combined with mind and coordination drills for super speed and endurance. Realign your body using a foam rolling technique and complete stretching routine from head to toe. A total body workout that pushes your body to use the correct muscles and proper form to handle resistance and instability movements. Uses a combination of balance, flexibility and strength to both tone your physique, while using breath work to calm your mind. Builds strength and balance by using explosive movements while improving alignment. Using unstable platforms, gain superior strength over that achieved through the use of traditional weight training. A workout focused solely on shoulder and arm strength. Focuses on the two largest muscle groups with a super workout containing pull up and plyo movements. Works the lower body with the use of four round complexes that boost performance with the use of “Post Activation Potentiation”. Uses “Post Activation Potentiation” training that focuses on the upper body. Is all about abs, these routines are designed specifically to build your core and build the abdominal muscles leading to the much sought after six pack abs. You get everything that’s included in the P90X2 base kit, PLUS two exclusive P90X2 bonus workouts to add even more variety to your program. Used in the X2 Recovery + Mobility workout, it’s an essential part of the P90X2 program! P90X2 uses stability training movements and routines for building balance and muscle development in most all of the workouts, this is another essential to get the most out of the program. Medicine balls are used in P90X2 for not just strength training, but balance and stability training as well. Yep, these are Tony’s very own signature PowerStands and the same ones he uses in his workouts. They’re super versatile and not just used for push-ups! Proper nutrition to fuel the body for workouts, while at the same time watching caloric intake, is half the battle. The nutrition guide shows you exactly how to fuel your muscles and help your body recover faster with daily meal schedules and recipes, while maintaining the correct caloric intake. The fitness guide is a great resource to have included in the P90X2 program and a one stop shop for questions, as it outlines the entire program and shows exactly how to use proper form with each exercise. The guide also gives insight on how to tailor the P90X2 program for each individual. The How To Bring It Again DVD is an overview of the complete P90X2 system. How To Bring It Again, takes you through nutrition, supplementation, vitamins and safety, helping you to achieve maximum results with the complete P90X2 program. The P90X2 calendar is a great tool for tracking workouts weekly and monthly, as well as, monitoring your results. Designed to help users stay motivated, ask questions, get answers and get new ideas. It’s around the clock access to fitness experts and peer support. P90X2 is the sequel to BeachBody and Tony Horton’s world famous P90X extreme home workout DVD program. P90X graduates, as well as, other brave individuals will find the new P90X2 program the toughest ever, this is far and away the toughest workout on the planet! Thank you for modern technology with options like “pause”, “stop”, “rewind” and “slow motion”…one thing we can say for sure is that these DVDs are going to get a workout themselves! P90X2 is still a 90 day program like its predecessor, with the major difference being that it is ONLY a 5 day a week program! Nope, folks were not kidding, it’s THAT serious. There are so many things to say about what we’ve seen so far regarding the workouts themselves. One other interesting fact to note is, that as if BeachBody and Tony Horton weren’t already serious enough about providing the most challenging and effect home workout possible with the previous versions of P90X2, they’ve brought on Dr. Marcus Elliott. From what we’ve been told so far Dr. Elliot was brought in to oversee the generational or phase work of the program, ensuring maximum results from stacking intervals. We were already aware of Dr. Elliot’s prior work with top athletes to improve performance in various disciplines and degrees, but BeachBody released a statement that he will now be sitting on, or rather, presiding over Beachbody’s Scientific Advisory Board. So, what’s new in the P90X2 program? This is where one of the early names for the P90X2 program, called P90X:MC2, came from. When we first heard the name P90X:MC2 we were thinking “Einstein” (remember E=MC2 the theory of relativity), but no as it turned out the MC2 was for Muscle Confusion 2. If you’ve completed the original P90X program, the P90X Plus program or the P90X One on One program, then you’re already familiar with “muscle confusion”. The new P90X2 program uses the same non-plateau mix up that was seen in it’s predecessors, with more of it. If you’re not familiar with muscle confusion, it’s based on the fact that most workout routines tend to use the same movements and routines over a long period of time. This in turn causes your muscles to plateau as they adapt to the limited routines. In comes muscle confusion, muscle confusion mixes things up so that your muscles don’t have the chance to plateau. You’re still working the same muscle groups, but mixing up the routines frequently. Well as it turns out, when you work harder and more intense, the training volume needs to decrease for maximum recovery time. Recovery time is when your muscles actually grow and change. Taking the research and knowledge from the previous P90X programs and we’re pretty sure the help of Dr. Elliot, efficiency is one of the benefits and the key to the success of P90X2. The actual P90X2 workout itself is very familiar to the movements and routines found in P90X, with the difference being that the workouts are way more intense! As an example, push-ups that were being done in the older P90X program using 3 stable points of contact (power stands) are now replaced with 3 unstable contact points (medicine balls). This instability allows you to get the same muscle group focus, while at the same time working other muscles (to keep balanced, think core) to improve over all balance and strength at the same time. At the core of the P90X2 program is the focus on foundation, strength and performance. Again, taking the research and knowledge from the previous P90X programs and expanding on it, the P90X2 workout uses the latest applied science to make the most of efficiency, while maximizing results.